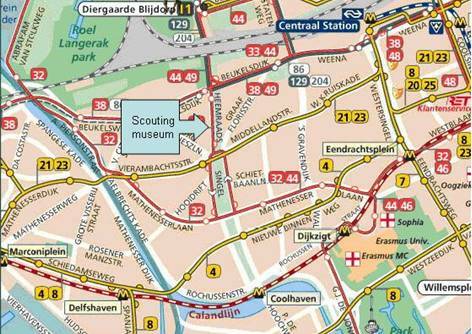 Take bus 38 (direction Schiedam) or 44 (direction Zuidplein). With tram 21 (direction Schiedam-Woudhoek) or 23 (direction Vlaardingen-Holy). Walk back, turn left Heemraadssingel. After the tunnel straight ahead, Heemraadssingel. Direction Schiedam / Hoek van Holland. At the first traffic light follow direction Centrum. Direction Schiedam / Vlaardingen (A4). (B) Direction Maastunnel / Centrum. After town canal turn right Heemraadssingel. Phonenumber of the museum (only during opening) Tel. 010-4256099. The museum is always interested in "old" Dutch Scouting items. Are you considering throwing your old stuff away, please contact us.